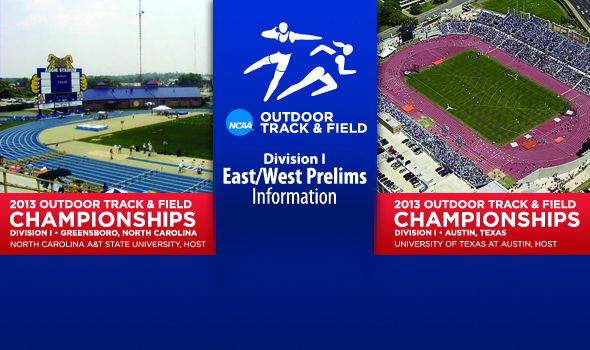 NEW ORLEANS – This weekend begins the three-week, three-location process that is the NCAA Division I Outdoor Track & Field Championships, beginning at the East and West Preliminary Rounds in Greensboro, N.C., and Austin, Texas, respectively this Thursday through Saturday and culminating in the National Finals in Eugene, Ore, on June 5-8. Start lists were announced Tuesday, but at the risk of repeating much of the same information in a full-fledged NCAA Finals preview in a couple weeks’ time, this feature will focus less on the match-ups themselves and more on the process whereby student-athletes will qualify for the NCAA Finals at Hayward Field. Check out the pre-NCAA rankings landscape here. A total of 96 student-athletes (48 East/48 West) in each individual event and 48 relay teams (24 East/24 West) will compete at the two Preliminary sites this weekend based on their schools’ geographical location, a total that will be pared down to the final Eugene-bound 24 individuals and relay teams by sundown Saturday.